Apple $AAPL is up more than 4,300% since March 2003, the beginning of the bull market following the stock market bubble burst (post 9-11). The stock is up slightly more than 1,200% since I started covering it online (my blogger blog which pre-dates the blog you are reading). I have owned APPL on multiple occasions over the past 6 years but I wish I could sit here and write to you that I was a holder the entire time (my gains are just a small slice of the longer term buy and hold pie) . I wasn’t a 1,200%+ gainer but I was in and out while taking profits on a yearly basis back in the mid to late 2000’s. Below is an example of yearly posts I made about Apple or as I called it “Green Apples” due to the fact that it was a cash register stock. So, with all that praise and the massive gains, am I really turning bearish on the stock? 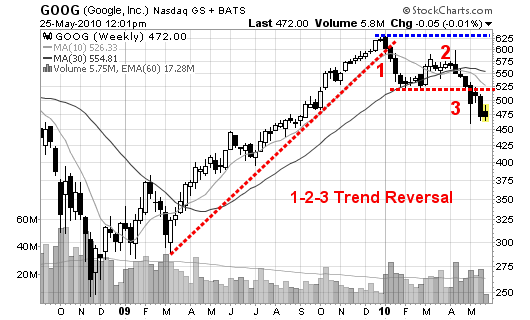 Is Apple starting to turn sour? Well, not so fast but some minor red flags are starting to show up. Take a look at the charts below which highlight the lower highs and lower lows. Apple is still trading above the 200-d moving average and has not violated any long term trendlines so please do not short at this time. You may cash in shares and start to trim back your position by selling but I don’t advise going short just yet. The ideal position to sell short is after a move below the 200-d ma when the stock tries to break back above but fails – that’s my sweet spot. 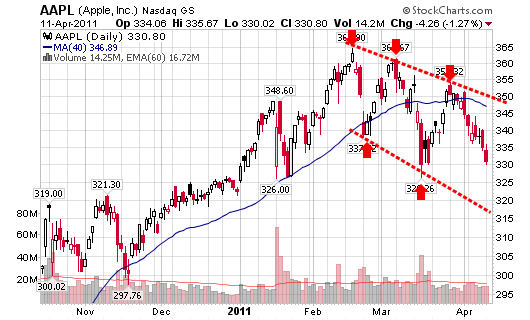 As of today, April 11, 2011, I suggest cashing in some shares. A further drop and I suggest selling more shares. I wouldn’t even consider the word “short” until the stocks closes below the 200-d ma (trend trade of course – not day trading). Let’s see if this decade long “Green Apple” turns into a “Sour Apple”. 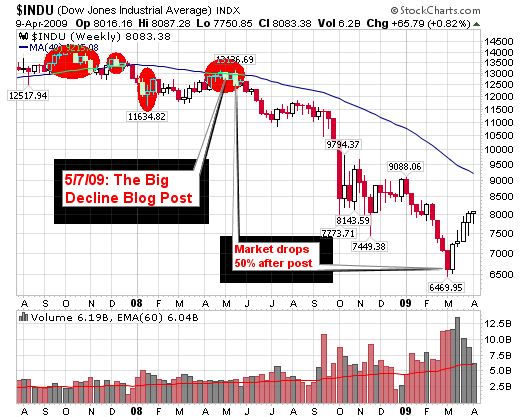 How can you tell when a market is exhausted from a long term up-trend? The current market leaders will start to form climax tops after huge gains over the past 6, 12 or 18+ months. So, how do we identify a climax top? 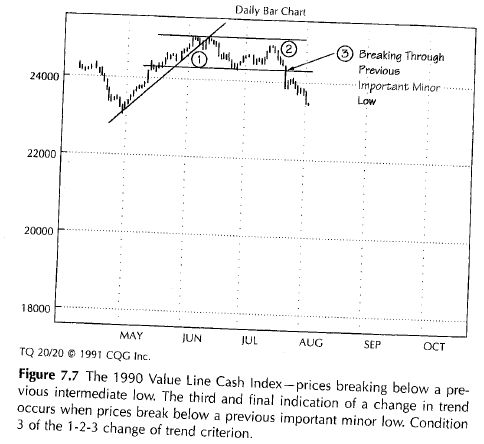 A quick run-up or accelerating gains over a short period of time after a long term up-trend. The gains will be much larger during this short term run, proportionally, than the entire up-trend. A large gap-up after several months of a steady up-trend. Investor’s Business Daily (IBD) calls this an “exhaustion gap”. The largest daily and/or weekly volume of the entire up-trend. A large single day point gain, the largest of the entire up-trend. 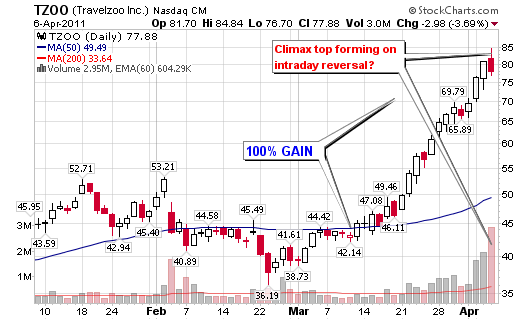 An intraday move to new highs on above average volume but a close that results in a loss. 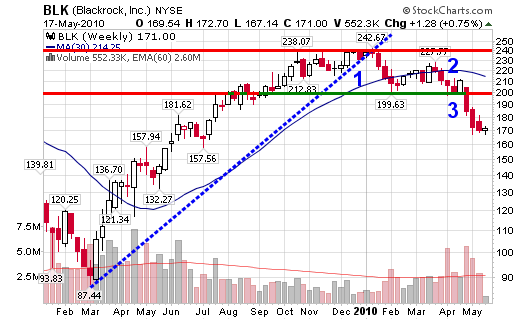 A stock that is trading 100% above it’s 200-day moving average. 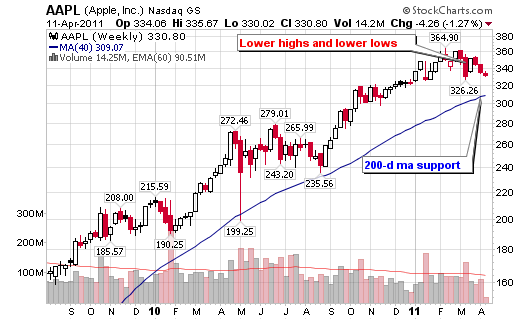 IBD states that a stock trading 70% above its 200-day moving average is showing exhaution. 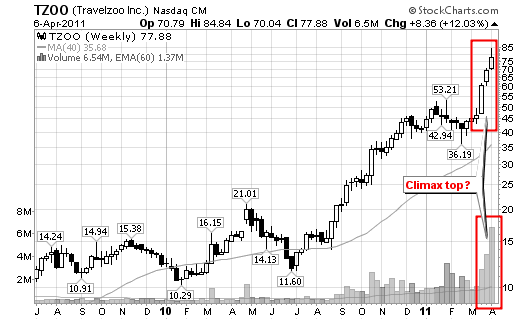 Take a look at the $TZOO Travelzoo charts (daily and weekly). 10 of the past 13 days have been up days. A 68% gain over the past 13 trading days and a 100% move over the past month. Stock is up 900%+ since March of 2009. The largest daily and weekly volume of the entire run. A new high intraday with a close that resulted in a loss (today: a new high with a reversal to close down 3.69% on volume 485% larger than the average). 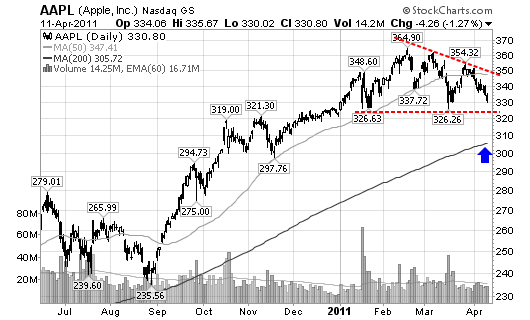 The stock is trading more than 130% above its 200-day moving average. With all that said – what should you do? I suggest that gains are locked in, at least a portion of your position 1/3 or 1/2 at a minimum. In addition to locking in individual gains (in examples like TZOO), I highly suggest that you start to watch all market leaders and the general market indices for red flags.